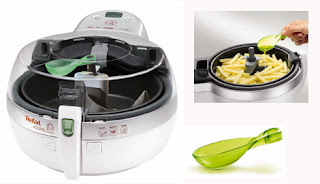 A few weeks ago I got an email asking if we would like to review the Tefal Actifry - I was really excited because I'd seen one on This Morning or Something For The Weekend (one of the two) and it looked fabulous. At the time I pestered Chris like a small child because I wanted one for our tiny kitchen, but he said no because we didn't have the money or the space. I replied to the email with a yes and did my evil laugh in response to Chris' earlier 'NO' (mmmwahahahaaa) - I always get my own way in the end! "The Tefal ActiFry is a revolutionary new gadget that allows all your favourite foods to be cooked using just one spoonful of oil. Whether it be light, fluffy chips or crisp, succulent chicken drumsticks, the ActiFry uses a unique rotating mixing paddle, so that food is coated in oil to give the best crisp finish with only 3% fat. The specially designed paddle gently stirs the food, coating the outside each with a fine mist of oil to deliver delicious, low-fat results each time. Mums on the go will love the innovative ActiFry as one spoonful of oil cooks enough chips for a family of four. The removable aluminium bowl has a non-stick coating for easy cleaning, and the bowl, lid and paddle are all dishwasher-safe making it the essential item in any family kitchen or chip loving bachelor pad." We've been using the Actifry for a couple of weeks now and me and the man are both really impressed. I'll be honest, when we heard we were getting one our immediate thought was chips, chips, chips but we haven't really used it for that - instead we've we've cooked loads of really delicious stuff but not that many chips! We have hardly used the oven since it arrived - it's a great little gadget - well I say little, it's actually quite large in our oopa loompa sized kitchen but nevertheless, we use it so often that we allow it to take pide of place on our work-top. You don't need to preheat it which is always a winner in my house - whenever I cook anything I always forget I've put the oven on and then an hour later wonder why it's so hot in the kitchen - oh yeah I was supposed to making dinner! The bowl is really easy to clean as it detaches from the fryer along with the paddle. I found that the paddle was a bit trickier in the cleaning stakes. After we'd used it to cook bolognese, food did get wedged in the underside of the paddle and I found myself stood at the sink with the dish-brush thing-a-me-jig for a good ten minutes. Both the bowl and the paddle can be put in the dishwasher if you're lucky enough to have one. It is rather pricey at the RRP of £199.99 and if you were only going to use it for chips it then it's probably not worth the bother (although the chips are good!) If like us, you plan to use it most evenings for your family meals then it's well worth the money and I happen to know that there are some really great deals on the ActiFry at the moment - Amazon had them for £99.99 last time I looked. If you're worried that you won't know how or what to cook in it then use the recipe book that comes with it for inspiration... We did and we love it.